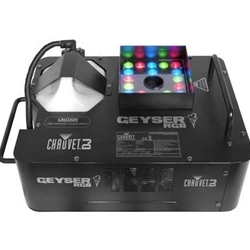 Chauvet Geyser RGB LED Light & Fog Machine In One Make a statement with Geyser RGB a unique effect fogger that adds a touch of drama to any performance. This powerful fogger blasts a vertical stream of safe, water-based fog while simultaneously illuminating it with 21 high-power (3W) LEDs. A combination of red, green and blue LEDs allows you to easily mix the perfect color to illuminate the fog. Features: Produces a 25FT high column of illuminated fog 21(3 W) RGB LEDs Help to create a bright colorful stage effect. Independent color control. Set on the unit and triggered by remote.